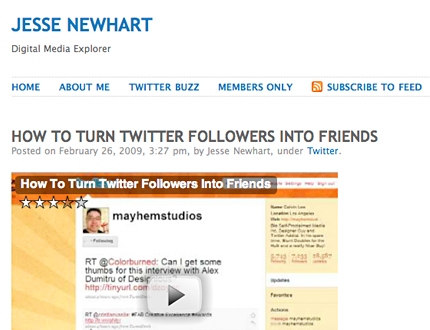 Jesse Newhart, Digital Media Explorer and owner of JesseNewhart.com has a really great video on his blog "How To Turn Twitter Followers into Friends." Jesse takes you through how to becoming friends with your followers and succeed in building relationships on Twitter. Jesse uses me, Mayhem Studios as an example of how I built relationships on Twitter, by helping others out, participating, interacting, tweeting using information, retweeting others, being part of the community, replying to questions, having good manners and sharing part of your life. Another great video, "Now Your Followers Are Friends. Now What?" from Khayyam Wakil, I am Khayyam blog. A follow up to Jesse's video, "How To Turn Twitter Followers into Friends." Khayyam goes over how to use Twitalyzer and what all the numbers mean. Twitalyzer is a unique tool to evaluate the activity of any Twitter user and report on relative influence, signal-to-noise ratio, generosity, velocity, clout, and other useful measures of success in social media. He also talks about how Twitter is mainstream from ABC News, "Tweet Like a Bird: Your Guide." Hey thanks for the shout out Calvin! I can't wait to start doing these videos on a regular basis. I either need two of me to keep up to you or I need to come and slam your fingers in a door so I can slow you down a bit and keep up - lol.